Hosted by USJC President Irene Hirano Inouye and Los Angeles Mayor Antonio Villaraigosa, the summit reunited representatives from the government, non-governmental, non-profit and community groups that gathered one year ago in the immediate aftermath of the March 11, 2011 disaster. This time, the topic of discussion was the state of Japan’s recovery efforts and the work that remains to be done. Among the new efforts toward recovery and revitalization is Tomodachi, presented by Hirano Inouye as a combined initiative of USJC and the U.S. Embassy in Tokyo. The initiative will further the efforts of Operation Tomodachi, a U.S. Armed Forces-Japanese Self-Defense Forces disaster relief project. Tomodachi will pick up where Operation Tomodachi left off, taking a long-term approach toward deepening the relationship between Japan and the U.S. by raising funds to invest in Japanese and American youth. The organization’s first priority will be to support Japanese youth by providing opportunities for educational and cultural exchange. In addition, Tomodachi plans to start a program in the vein of the council’s existing Japanese American Leadership Delegation that will bring Japanese leaders—particularly young leaders—to the U.S. to build relationships with their American counterparts. The organization will also invest in entrepreneurial efforts in the Tohoku region in the hopes of helping to reinvigorate the local economy. 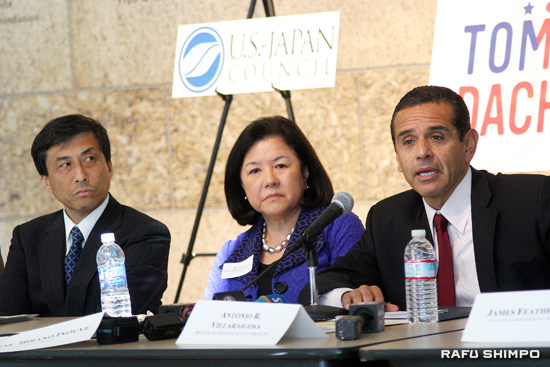 Villaraigosa spoke about his experience traveling to Tohoku last year, describing the extent of the devastation he observed, how much Americans have to learn from Japanese disaster preparedness and response, and how he hopes to continue extending support to Japan. Consul General Jun Niimi was also present, and gave a report to those gathered about the current status of the Tohoku region. While the Japanese people and government have made strides toward recovery in the form of temporary housing construction, the formation of a government Reconstruction Agency, and collection of 96% of the debris in the area, many serious challenges remain, not least of all the placement of orphans and evacuees.